If there was ever an artform that truly spoke the language of my soul, it would have to be this one. I've been following the beautiful streams from The Color Condition for quite some time through their instagram, but had never seen a piece in living color. Living color it was! For the past month, Galleria Dallas has had this amazing chandelier of color above the ice skating rink. The piece comes down today, so I'm so glad I got the chance to admire this massive wonder for just a little bit yesterday afternoon. It is absolutely remarkable. Anyone else need their whole house to just have these gorgeous streams of color covering the ceilings? It seems like everything would always be a tad better if you could stare at these beauties dancing in the wind (or air conditioning draft) all day. 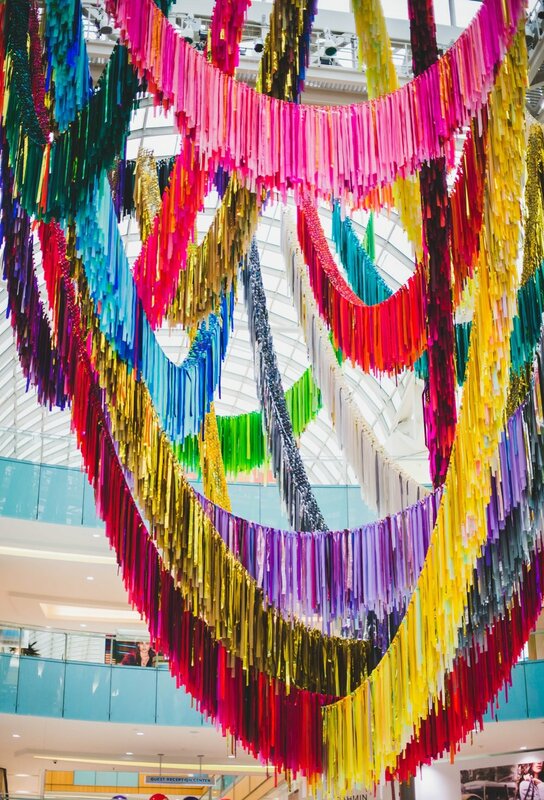 Keep up with The Color Condition through their social media (Insta, Twitter, FB) or website, so you can catch a future public installation or learn more about this one on Galleria Dallas' blog.